Made from our durable flexible plastic. 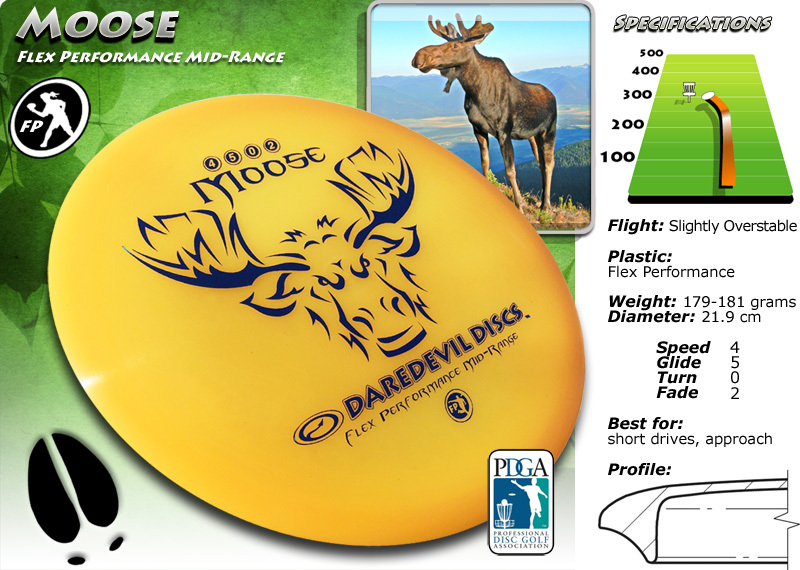 The Moose is designed for intermediate to advanced players. It’s softer feel also makes it an excellent cold weather disc. Found throughout Canada, the moose is the world’s largest deer and lives up to 20 years old. A moose’s long legs allow it to move easily over rough terrain and deep snow. They can run up to 35 miles per hour and can swim more then 10 miles. The moose can grow to be over 3 metres (8 to 10 feet) in length and a shoulder height of over 2 metres (5 to 7 feet). Males can weigh over 600 kgs (1320 pounds) and their large wide antlers can range from 120 to 150 cm (4 to 5 ft) across. The moose uses these large antlers and their sharp hooves to hold off predators. These herbivores feed on branches, berries and leaves, but also eats water plants that grow in lakes/marshes and can actually feed under water. While in the water their two large toes spread wide apart to keep the animal from sinking.